We are delighted to announce that Rapaura Springs have been awarded Silver Medals across the board in the International Wine Challenge 2017! 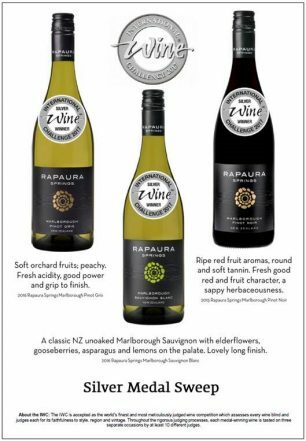 Rapaura Springs have achieved excellence across the range in one of the world’s premier wine competitions with the Sauvignon Blanc 2016, Pinot Gris 2016 and Pinot Noir 2015 all receiving this prestigious accolade. The Pinot Noir was praised for being full of “ripe red fruit aromas, round and soft tannin. Fresh good red fruit character, a sappy herbaceousness”. Contact Christine to find out more about these award winning wines.